I don’t frequent the Evil Empire that much anymore, but Starbucks is getting my patronage today because it seems to be the only place in Heidelberg that offers air conditioning. It is stunningly hot here—ninety-plus degrees, no breeze, and not much to speak of when it comes to shade, as the Old Town features narrow cobblestone streets without any trees to line them. (It reminds me of some of the small towns I visited in Italy in that respect.) And virtually nothing—including my hostel—is air conditioned; those places that are, like trains and buses, have the thermostat set so high that it doesn’t seem to make much difference, particularly when people pile on. What I’ve realized in the past 24 hours is that I’ve become accustomed, in both the United States and China, to heat and humidity being temporary problems, dealt with only as I move from one air conditioned bubble to the next. That mindset simply doesn’t exist in Europe. Better for the environment, I know, but I’m now worried that I won’t get a good night’s sleep until I’m back in New Jersey. 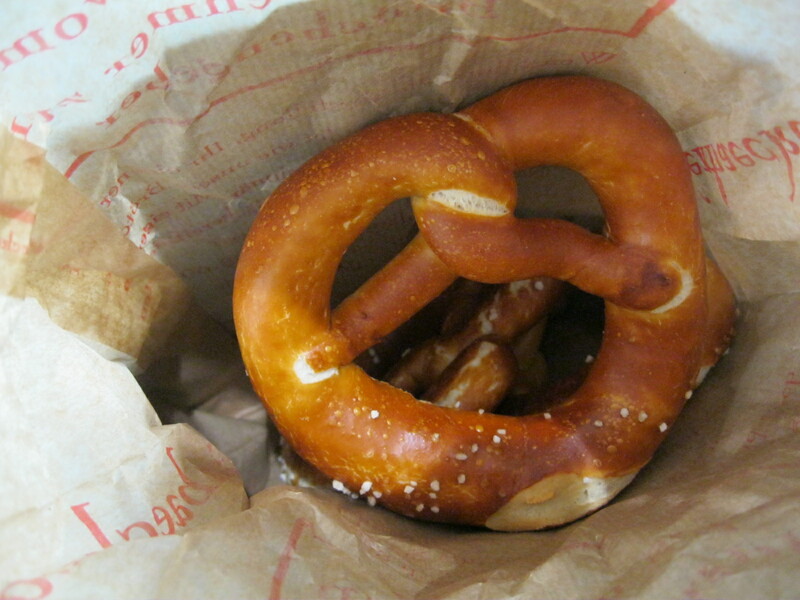 I enjoyed two of my authentic German pretzels—which are, I have to admit, much better than those sold by the side of I-95 outside the Philadelphia sports complex—on the train from Frankfurt to Mannheim. The ICE train was very nice, with comfortable seats and a coffee-seller roaming the aisles, and the scenery between the cities featured lots of flat fields with bales of hay sitting in them. Contrary to what I’ve heard about German trains, however, it was not on time, arriving at Mannheim about five minutes late. Trains run between Mannheim and Heidelberg every fifteen or twenty minutes, but I still sprinted for the one I had purchased a ticket for, preferring not to find out if I’d run into problems taking a different train on that ticket later. I didn’t have to worry: no one ever checked my ticket on the light rail to Heidelberg. I had forgotten that public transit in Europe is sometimes on the honor system, and they just do spot checks to keep people honest from time to time. In the past two days, I’ve taken the bus and trolley about half a dozen times and no one has asked to see my ticket yet. 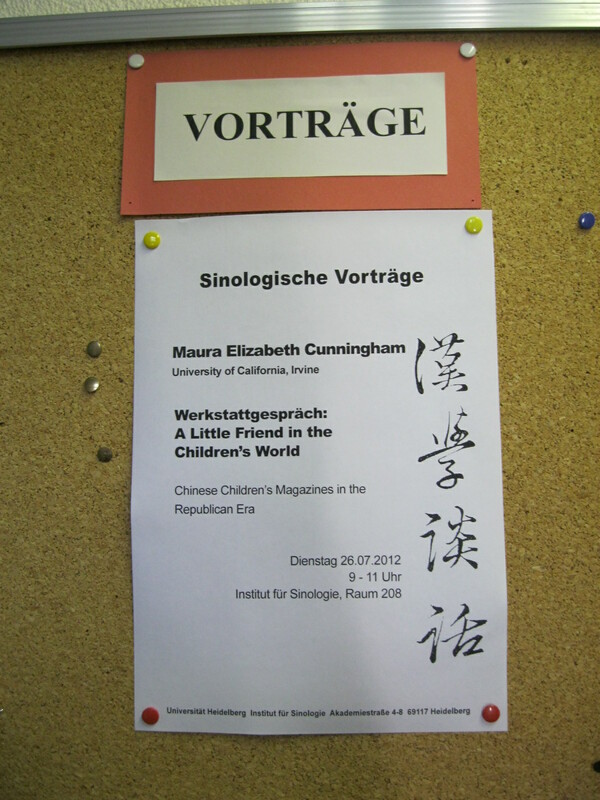 A poster announcing the workshop I’m here to attend; these are hanging all around town. 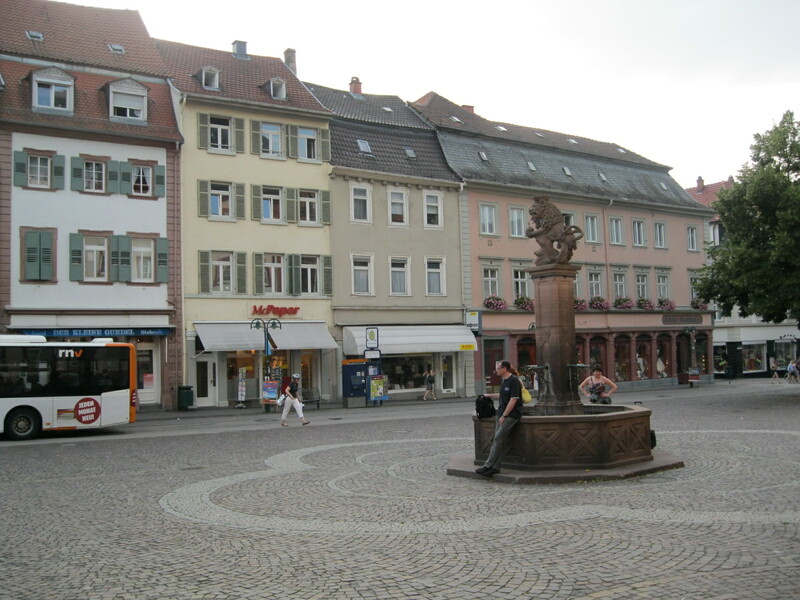 I arrived at the small Heidelberg train station and walked a few blocks to my hostel, which aside from the lack of air conditioning is nice but unremarkable. It is, though, about a 30-minute walk from the Old Town and university district, so I set off for that area by bus instead. 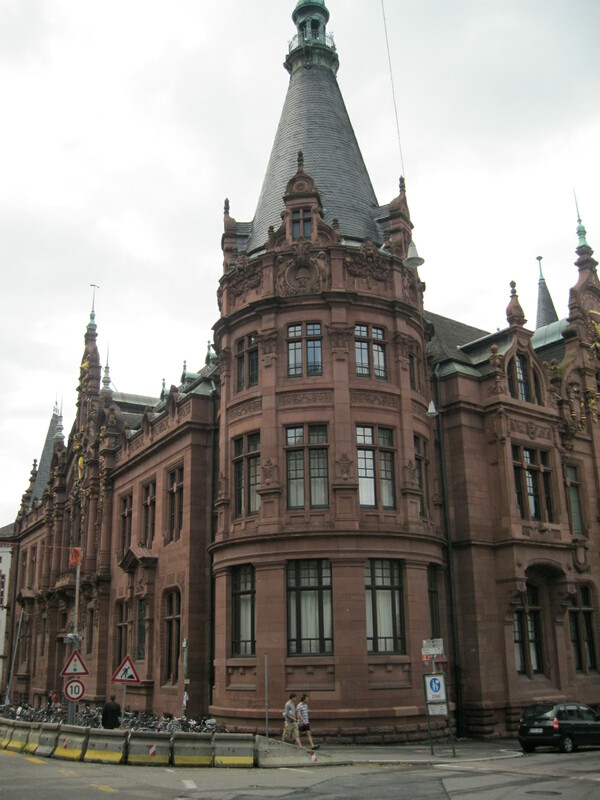 I wanted to make sure I’d be able to find Heidelberg University, since I was giving a talk to Chinese history students there early Thursday morning and I was afraid I’d get lost if I didn’t do some reconnaissance ahead of time. I found the university pretty easily (the bus stop is Universitätsplatz, so that was a hint!) and joined the tourists walking around in the midday heat. I heard a number of Americans and Italians, but the town’s visitors mainly seem to be other Germans. The Old Town area is pretty typically touristy: souvenir shops selling t-shirts and beer steins, biergartens offering an authentic German experience, and many, many gelato stands. All of them seem to sell a creation called “ice cream spaghetti,” which looks like spaghetti with meat sauce but is sweet and made of ice cream and toppings. I’m simultaneously repulsed and fascinated by it, which means I definitely have to try it before I leave. On Wednesday afternoon, I just got a cone, which presented me with my first real chance to speak German. I hadn’t even attempted this when buying train tickets or checking into the hostel, as I figured those were too important to risk incomprehension. For the pretzels, I had just pointed and said “drei” (three), which worked fine. But naming gelato flavors would require a little bit of actual conversation. It didn’t go all that well. The gelato seller greeted me in Italian and I replied in German, then told him the two flavors I’d like in my cone. I pronounced one so badly, though, that if he hadn’t known I was an American already, he did then. He corrected my pronunciation and switched to English, but I pressed on in German and he went along with it. By then, however, I was so flustered that when he said “Tschüss” (bye), I answered with “zai jian” … which is Chinese. Blame it on the jet lag. It is really interesting, though, to be in a country where people don’t know just by looking at me whether they should expect me to know the local language or not. One of the things I noticed in Shanghai last year was that there’s an increasing tendency for Chinese in that city to assume that foreigners know Chinese, but that’s far from the norm and also quite new. I’m more accustomed to seeing looks of apprehension as I approach people and they worry (I assume) that I won’t be able to communicate with them. But here, most people have at least greeted me in German and then figured out from my pronunciation that I’m not a local, even when I try to stick with the language. By late afternoon, I was so tired and hot that I just went back to the hostel and napped—though that turned out to be the wrong choice, as I then didn’t fall asleep until almost four o’clock Thursday morning. My talk was scheduled for 9:15 and I set my alarm for six o’clock so I could review my notes one more time, eat breakfast, and walk off the anxious energy I always get before speaking in front of a group. Add in a cup of bakery coffee and I was pretty wired by the time I arrived at the university. As it turned out, only five people (two professors, three students) came to my talk, so it turned into more of a discussion than a lecture. I guess it went well. I spent the rest of the day walking around and picking up the things I had, inevitably, forgotten. I went to a Woolworth’s for shampoo—I didn’t even know they still existed anywhere, but it’s definitely the same chain that used to be in the U.S., and it was just as grimy and crowded as the ones I remember. When I went to get onto the tram back to the hostel shortly after eight o’clock, I was surprised to find out that I had just missed the last one of the day. There’s a bus that goes to the same stop, and I saw one getting ready to pull away across the street; I ran over and got lucky when the bus had to stop at a red light and the driver opened the door for me. If I’d missed that, I would have had to walk back to the hostel—it was also the bus’s final run of the day. In a move reminiscent of Southern California, the public transit here either stops or reduces its service at 8:00pm. Most of the small restaurants and stores close then, too, though larger places and fast food outlets remain open until later. Given that it doesn’t get fully dark until almost 10pm, it’s difficult to remember that most places shut down early. Today, for the first time, I felt like I had a normal day. I slept a reasonable amount, got up and dressed, picked up some coffee, and went to … school? Yes, school. I had thought I would have today to begin my sightseeing, but yesterday the professor who invited me here mentioned that her popular culture seminar was having its final meeting all day today, which would consist of her students presenting their research and discussing each other’s works in progress. She said I was welcome to come to the seminar if I’d like, and I decided I would go for the morning, meet some of the Heidelberg graduate students, have lunch with them, and then go off to sightsee. As it turned out, I was having such a good time by lunch that I decided to stay for the rest of the afternoon! So now I’ll have to fit my tourism into Saturday and Sunday. I realized that lunch today (at a café near the Chinese studies institute) was the first time I actually sat down and had a real meal since I got here. It’s been so hot that eating anything heavy seemed unappealing, and the bakeries and snack stands are so plentiful that I’ve just been picking up small things every few hours as I walk around. One of the Heidelberg students told me that there’s a law against air conditioning in government buildings (I guess state workers are supposed to set an example and be willing to sacrifice? ), and that there are really only two hot weeks every summer anyway. I just happened to be here for one of them. It’s supposed to cool down and get nicer in a couple of days, and I’m really looking forward to that. Almost all of the students today presented in English, and the one who spoke in German was clear enough that I could more or less understand what she was talking about, even if I didn’t catch every word. Yesterday I was jet lagged and felt like I was completely unable to express my thoughts in a manner that anyone understood; today I actually managed to conduct a number of food transactions entirely in German. I don’t think I fooled anyone into thinking I’m a native, but they also didn’t switch to English out of frustration with me, either! I feel very much like I did the first time I went to China: I know enough of the language that I usually have a general idea of what’s going on (it helps if I have some context for what’s being said, of course), but my speaking ability is way below the level of my listening or reading comprehension. On the one hand, that’s really frustrating. On the other hand, I’ve realized that if I really put some effort into improving my German, I could probably become at least as fluent as I am in Chinese (and in much less time, I suspect). 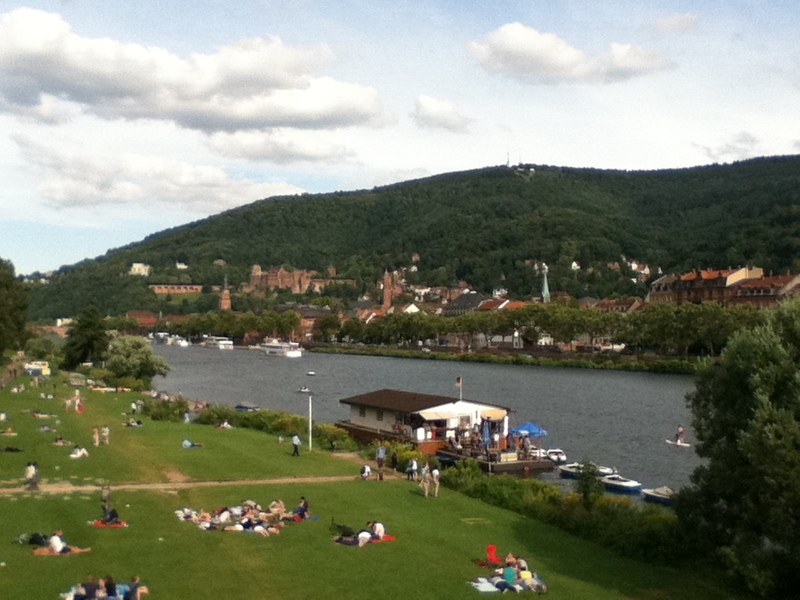 The seminar today lasted until 4:30, after which I walked around Universitätsplatz for a while and then remembered that my Heidelberg Card (a tourist pass that grants free public transit and lots of discounts) came with a reduced rate for a short boat tour along the Neckar River. I checked the pamphlet I had gotten with the card and saw that the final run of the day would depart at 6pm, so I walked down to the dock next to the Old Bridge and found the boat there. Only about ten other people took the tour, which lasted fifty minutes and just went up the river a bit, turned around, and came back to the bridge. It was interesting to see that people really enjoy the river; there were lots of sunbathers and picnickers in a large park on the banks, and a number of scullers out rowing alongside us, as well as a couple of swimmers. While the Old Town is filled with narrow row homes, on the opposite side of the river I could see much larger houses and what I think were apartment complexes. In town, everything seems crammed together and there are often multiple drivers, cyclists, and pedestrians all trying to get through streets that are only a bit wider than a single car. 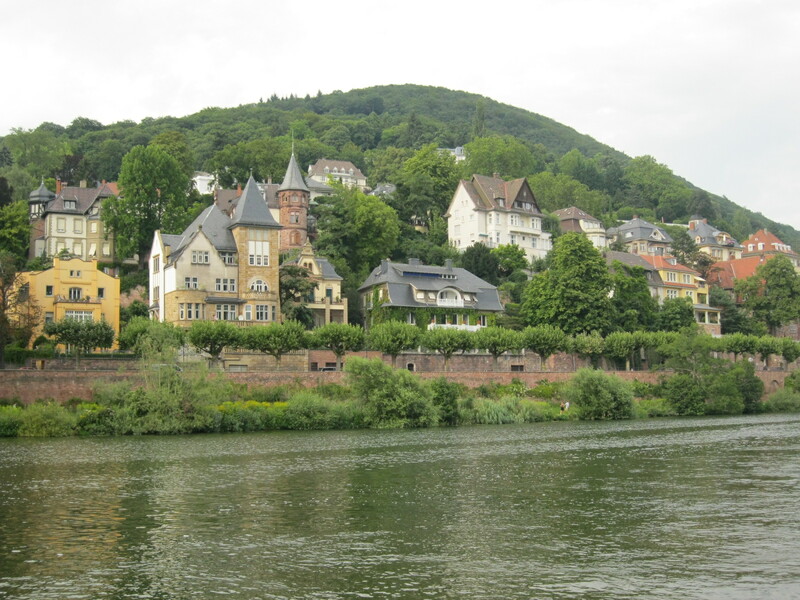 I can see why someone would want to move to the other side of the Neckar and get a bit more breathing—and living—room. 9:30am: It poured rain over night and is now much, much cooler! Still cloudy, but the sun is peeking through at times and I’m hopeful I’ll get lots of sightseeing done today. 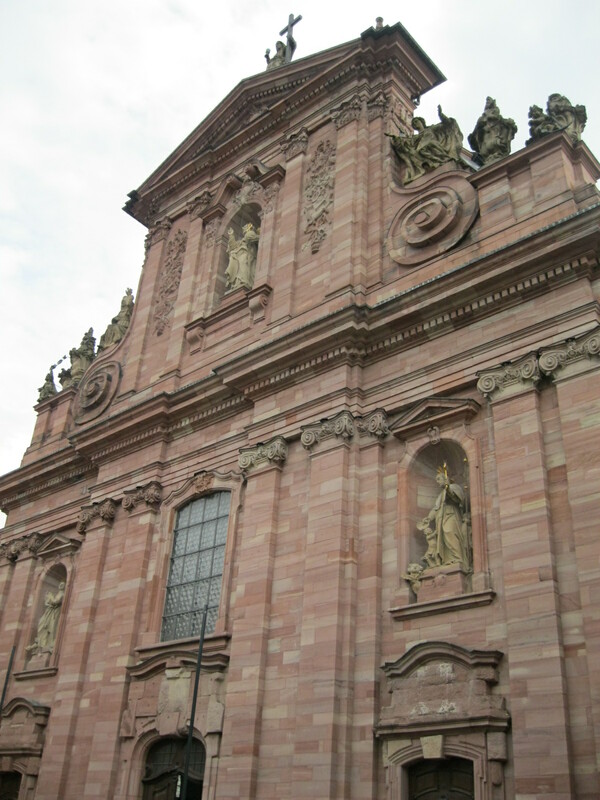 3:00pm: I was doing really well seeing the sights of Heidelberg, but about ten minutes ago dark clouds started gathering over the town and it began pouring rain and lightening. I’m hanging out inside one of the university buildings now, writing and waiting out the storm. I began in the exact same building this morning, as it houses the university museum and connects to the old Student Prison (really!). The museum is not large—just three rooms—and for reasons that I really don’t understand, only the third room has English text on the placards. I guess only Germans are expected to care about the university’s history before 1900? I tried to read some of the German placards, but gave up on that after a little while and was about to leave when I realized that the third room’s exhibits were bilingual. I spent a lot of time in that room; Heidelberg University had quite the history during the twentieth century. 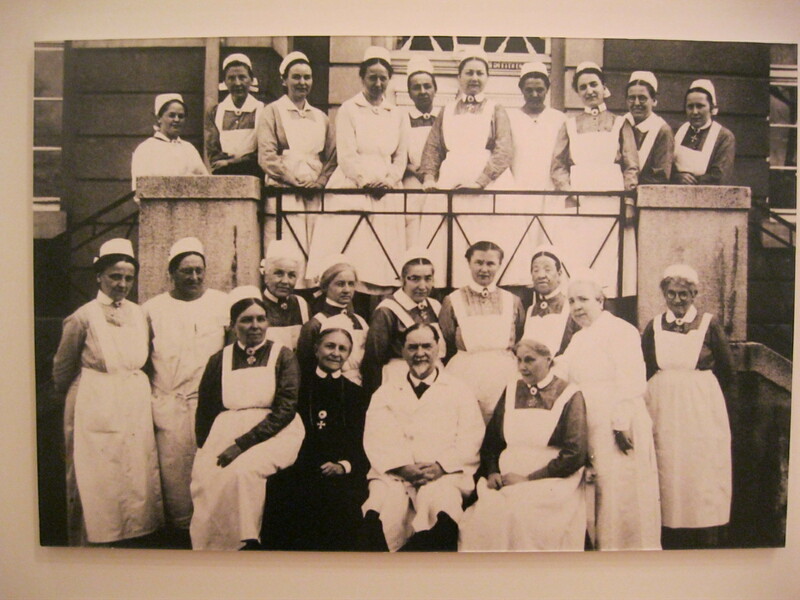 Heidelberg nurses in the early 20th century—one of the few ways women could be part of the university. At the beginning of the century, the university still only admitted men. In 1871, the university administration had issued a statement in which it declared that “it had never before come to pass that a wench (Frauenzimmer) had been matriculated or completed her doctorate.” Though women were sometimes admitted or hired in special circumstances during the first couple of decades of the twentieth century, they weren’t regularly included in the student body until 1920, when laws about equal access to education were passed. Within only five years, women composed 13.2% of the student body, though the Nazis later imposed a quota that limited women to 10% of the student population (this was done in the interest of getting women out of the employment arena and back into the home, [where they belonged]). Though this all went away after World War II, I was surprised to see that in the 1990s, the university undertook a campaign designed to increase the number of women in faculty and administrative positions and by 2007 had managed to raise that number to … 16%. A great leap forward. 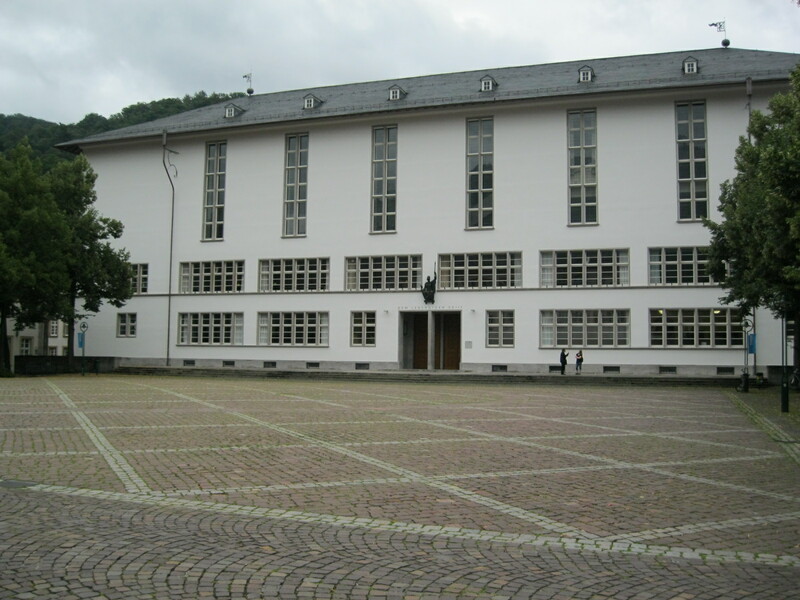 Though the high tuition fees limited the availability of a university education to primarily middle- and upper-class men in the early twentieth century, the Great Depression hit everyone in Germany hard, including Heidelberg students. The museum had photos of young men working in coal mines and tobacco factories, where they returned to their rooms at the end of a shift and studied for the classes they were still trying to take. A large part of the museum exhibit concerned Nazism and how the university experienced it. Many Jewish professors saw their doctorates revoked during the 1930s, and they all lost their jobs after the Nuremberg Laws were passed in 1935. There were plenty of Nazi believers and sympathizers among both students and faculty; though some professors tried to remain politically neutral during the 1930s, no one could really escape the intrusion of the Nazi state into university life. I was most surprised to see one placard stating that the university library had not been cleansed of “politically sensitive” material during the 1930s, and wondered how and why it had escaped that. During the Second World War, the library’s holdings were moved into coal mines and agricultural areas to save the books from destruction. Though they gathered up everything again after the war ended, about 40,000 volumes were lost—I suppose people forgot where they had been hidden, or the people who had done the hiding didn’t survive the war to retrieve them. The weak response to dealing with Nazism came back to haunt the university during the 1960s, when it was one of many issues that students protested. Others included the Vietnam War, the Shah’s rule in Iran, the German Emergency Acts, and … increased fares on the Heidelberg trams. The Student Prison was small, but a lot of fun to see. 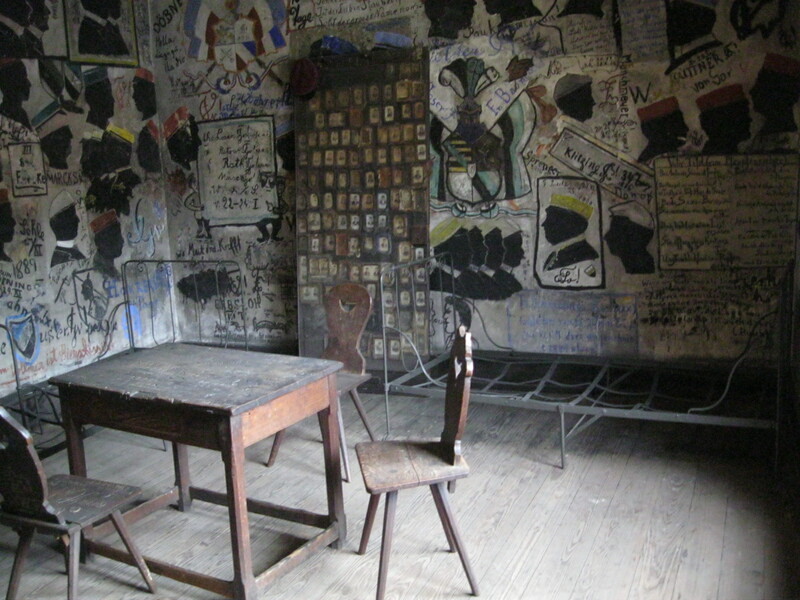 The most notable feature of the building is that every available surface is covered in drawings and text, which the student “inmates” drew or wrote on the walls during their prison terms. 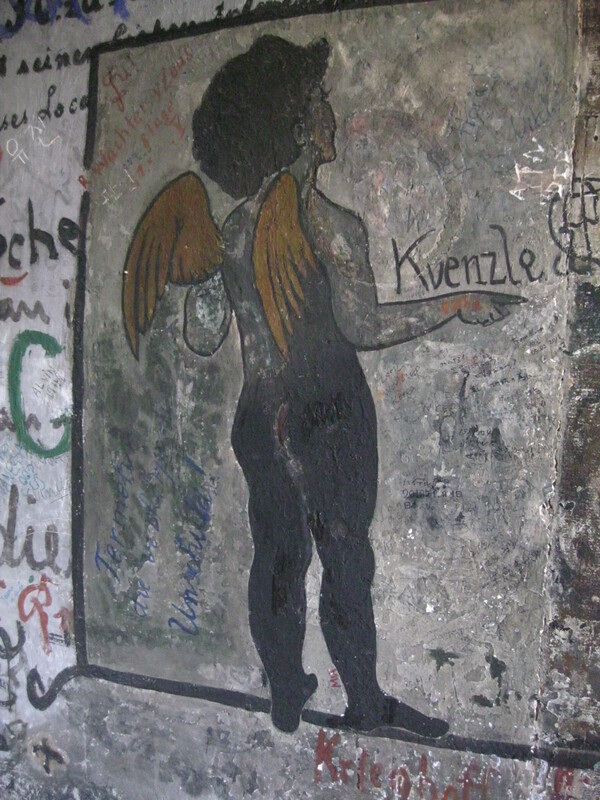 The stairwells, the hallway outside the cells, and every inch of the cells—they were all chock-full of graffiti. A history of the prison explained that adding to the art was how students spent their time when they were confined to the prison. Heidelberg University’s authority superseded that of the town government when students were accused of crimes, and those who were found guilty would serve their terms in the university’s small prison (I saw four prison cells, though there might have been more that aren’t open to the public now). The most common reasons for students to be imprisoned were (no surprises here) “disturbing the peace at night by loud singing in the city lanes, inappropriate behavior in public as the result of inebriation, and participation in illegal fencing duels.” By the 19th century, serving time in the Student Prison was actually considered something of a rite of passage for UH students. Perhaps this has to do with the fact that life inside the prison wasn’t exactly serving hard time. They could mingle freely with the other inmates and move from cell to cell (they were also expected to continue attending classes) and after two days of only bread and water, prisoners enjoyed whatever food and beer they had brought in from the outside. And they decorated the prison, first using soot and then, after the practice became a tradition, bringing paints when they arrived to serve their terms. Sunday, 8am:After the museum, I stopped at a Thai restaurant for lunch and then walked over to the funicular station to head up to the Schloss (castle) on the hill. 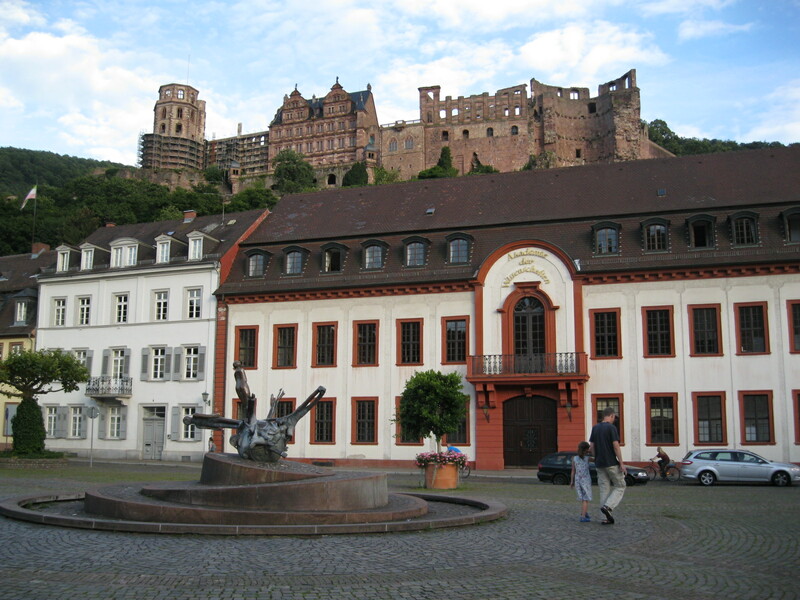 The castle is now mostly ruins, but it remains one of Heidelberg’s main attractions. The funicular ride is actually very short—about two minutes—and I realized I could have probably walked if I’d tried. I wasn’t prepared for the immensity of the castle; what I’m assuming was the moat (now dry, of course) extended down so far it made me dizzy when I peered over the side. 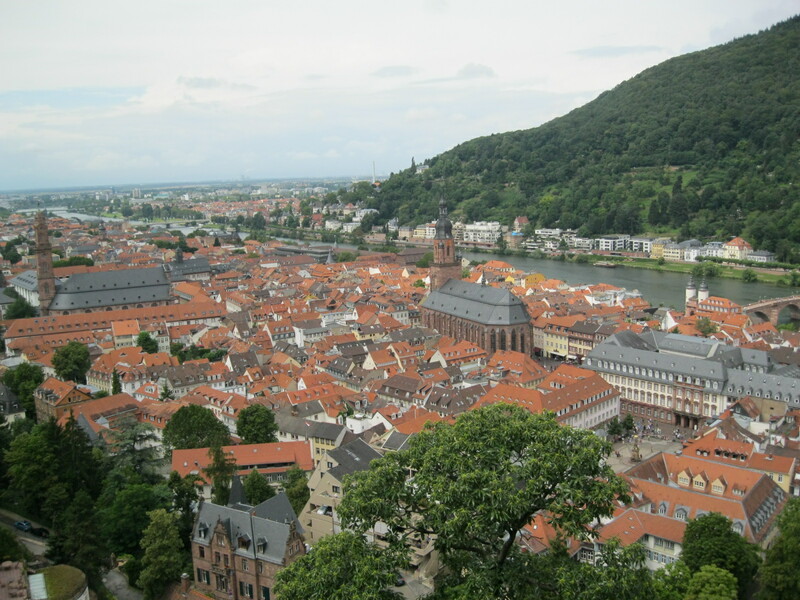 There were some great views of the Old City and Neckar River from the castle gardens, and dozens of people were jostling for the best spot at the railing so they could get pictures of themselves with Heidelberg in the background. 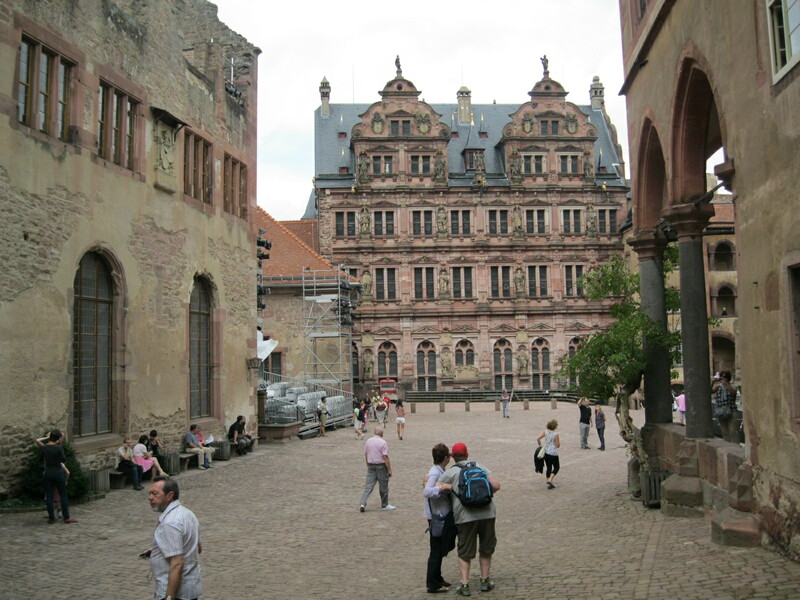 I walked around what remains of the gardens for a bit, then entered the castle courtyard. What surprised me the most was how steep the ground was inside: there’s really no single flat space that fits my mental image of a courtyard. Instead, the area enclosed by the castle walls was hilly and uneven (and cobblestoned—I saw more than a few people stumble) and I could really feel it in my legs when I walked up the hills! While the outside of the castle complex is comparatively plain, the courtyard-facing walls featured lots of statuary and gold accents; there was also something like a sundial (but not a dial) on one tower. 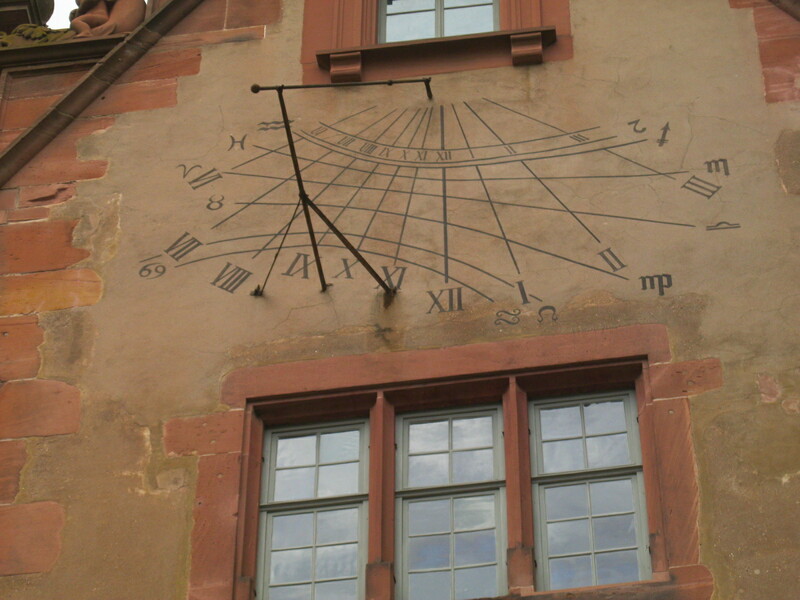 I’m not sure how it worked—or even if it was really a tool for telling time; that’s just what it looked like to me. A variation on a sundial, maybe? Most of the castle complex is closed to tourists. The only area that I could enter is where Heidelberg’s big claim to fame is stored. 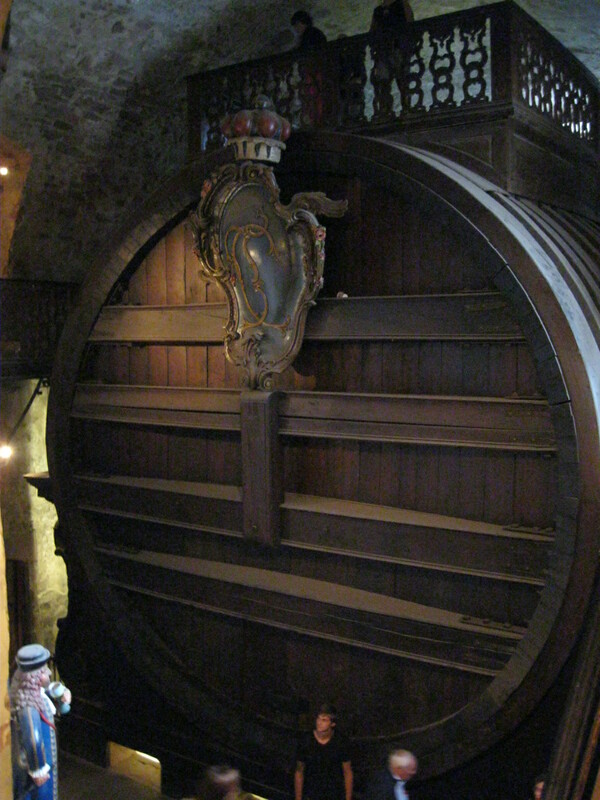 This is the Großes Faß: the Big Barrel. It’s an enormous wine cask, constructed in 1751 and capable of holding 221,000 liters of wine. Even though I assume hundreds of people lived and worked in the castle at any given time, I still wonder how quickly they would go through one fill of the cask. Wouldn’t the wine on the bottom get pretty disgusting by the time they drank their way down there? I’m thinking that wine production techniques weren’t terribly advanced at that time, and it seems like a lot of sediment would accumulate. I don’t know, but it’s a big cask. Right next to it, of course, is a small wine bar where they offer regional specialties and souvenir glasses, as well as the opportunity to create your own personalized wine label and stick it on a bottle to take home. I passed on that. Once you see the Big Barrel, you’re more or less done with the castle. And while the day had started out overcast and cool, by this point the sun had come out and it was getting pretty hot. After I took the funicular back down into Old Town and started walking back toward the university area, though, I realized that clouds were rolling in and café proprietors were rushing to bring umbrellas inside. Clearly, it was about to rain a lot. That’s when I took refuge in the university museum (which is also the administration building) and started writing this. The storm lasted about half an hour. Then, as suddenly as it came, it moved on and people started venturing back out onto the streets. By that point in the afternoon, Heidelberg was filled with tourists. I think the town is a day trip for many groups: they come in to see the castle, have lunch, walk around the Old Town and shop for a bit, and that’s it. I decided it was time to try the ice cream spaghetti that I’d been so curious about, so I picked one of the dozens of gelato cafés and sat down. I realized, upon looking at the menu, that they actually offer ten or twelve variations on the spaghetti I’d seen pictured. That’s made with vanilla ice cream “noodles,” strawberry sauce, and white chocolate bits to resemble Parmesan cheese. But you can also get tropical fruit spaghetti, spaghetti Bolognese (chopped nuts added to the strawberry sauce), and spaghetti Alfredo (vanilla sauce and chopped white chocolate). Basically, they made ice cream sundaes using strands of ice cream instead of scoops—which, of course, makes the ice cream melt faster! 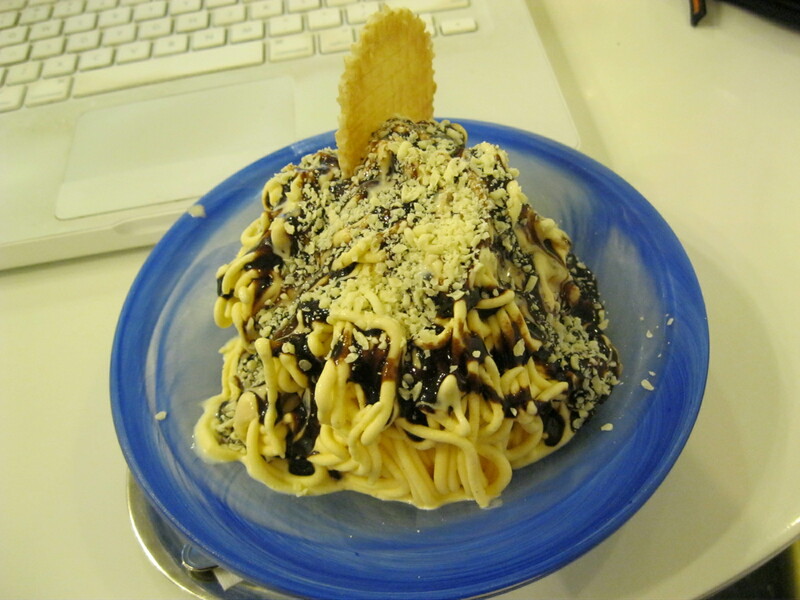 I got the “Spaghetti Schoko” (chocolate spaghetti): ice cream, chocolate sauce, white chocolate pieces. Though it looked a bit strange, it tasted fine. My map of the city has an extensive (three-four hour) walking tour planned out on it. While I didn’t want to do the whole thing at once on Saturday afternoon, I figured out a way to do about a third, taking me in the direction of my hostel, and then pick it up again on Sunday to work my way back toward Old Town. Most of the tour spots are university buildings and churches, which I suppose are two things every old European town has in abundance. I stopped at the Jesuit church first and was intrigued by the fact that though it’s an old building (construction began in 1712 and took 150 years), the interior is very modern. 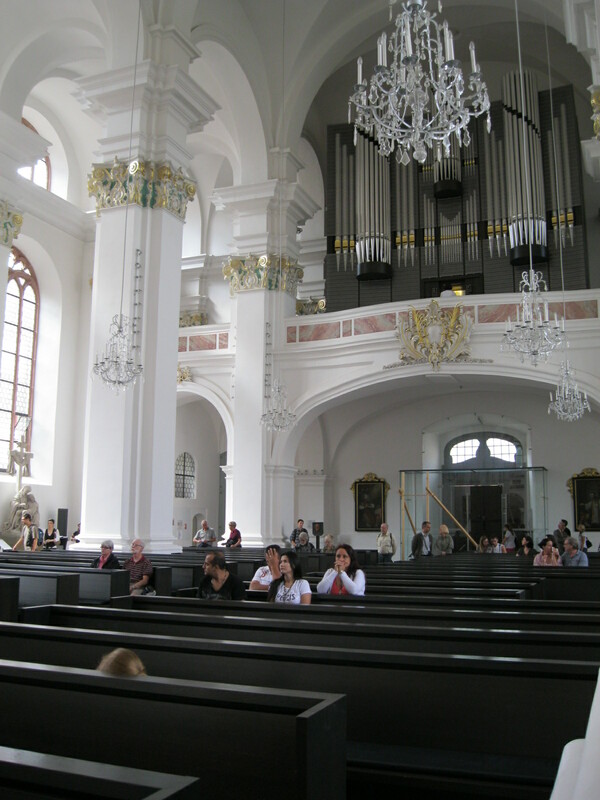 White walls, plain black wood pews that look like they came from Ikea, and small contemporary art installations scattered around the perimeter of the nave. It wasn’t at all what I was expecting, based on the Baroque exterior! I continued walking along one of the main streets leading back toward Bismarckplatz, where I planned to catch the tram back to my hostel. I saw a few more churches and found the university library, but mainly I enjoyed being away from Haupstraße (Main Street), the pedestrian walking street that’s the main drag in Old Town. It’s crowded and touristy, and while there’s plenty to see and do and buy, it was nice to walk through a quieter neighborhood and not have anyone try to sell me anything. 9am: Our workshop begins at 4pm today, so this is my last real chance to be a tourist. Unfortunately, the weather isn’t really cooperating—it’s pouring rain right now and I think that’s supposed to continue all day. I have plenty to read and write and edit, so right now I’m having breakfast (rolls and coffee) in one of the Old Town’s cafés and plan to hang out here for a while. 4:30pm: I don’t know how I did this—except it’s not the first time—but I showed up at 4:00 for the opening reception of the workshop and found … no one. Actually, that’s not quite true: some of the Heidelberg graduate students were there setting things up, and the faculty who are running the conference were in a meeting. It turns out that the meeting at 4, which I thought was for everyone, is just for faculty. None of the student participants are supposed to show up until 6:00. I’ll have to look at the schedule again to figure out what I read incorrectly. It rained for most of the morning (and my umbrella broke), so I sat and worked at Starbucks for a very long time. The sky finally started to clear around noon, which coincided perfectly with the point at which I couldn’t stand to be in Starbucks any longer. I walked down Hauptsraße for a few minutes and realized that there are large numbers of Chinese tour groups in Heidelberg today; I was experiencing cognitive dissonance with German, English, and Chinese all reaching my ears as I meandered down the street. I’ve been mixing up German and Chinese a lot, and I think the reason is my brain knows I’m supposed to be speaking a foreign language, so it reaches for the one I use the most—Chinese—and can’t access German quickly enough. I would probably confuse other people (and myself) less if I just spoke English, but I can’t stand the idea of not trying to improve my German at least a little. I decided to go local for lunch and picked out one of the German-style pubs that line Hauptstraße, all of which are tourist traps that no local would, I assume, even consider entering. Pretty much everyone else in there was an American, with one Chinese guy sitting at the table behind mine. 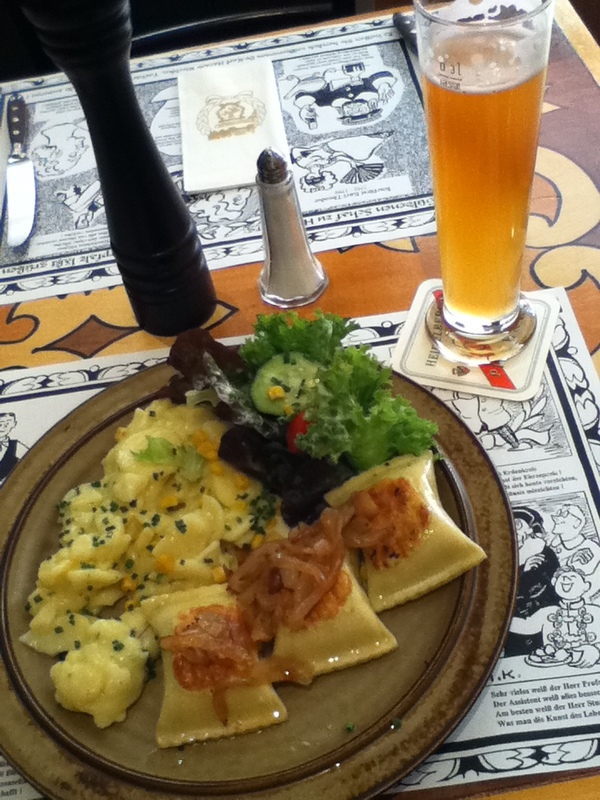 The menu had precisely two vegetarian options: a baked potato and salad, or German vegetable “ravioli” with potato salad. I had the latter, which was kind of interesting—I’m not sure I would go so far as to say it was “good.” The ravioli were large squares of dough packed full of finely minced vegetables, pan fried and topped with fried onions. They were dense and heavy, like all German food. I liked the potato salad a lot more, but they actually gave me about twice the amount that I wanted to eat. Long story short, I’ve reached my personal limit for German pub fare and will now return to sandwiches and Asian food. I walked around a little bit more before heading down to the conference building to get there far too early. One of the students setting things up suggested that I would enjoy walking down to the river while I waited for the reception to start, so that’s where I am right now. Given how miserable the weather was this morning, it’s unbelievable how beautiful it’s turned out to be today: very blue sky, big puffy white clouds, lots of sunshine, and just enough of a breeze to keep things from getting hot. In fact, it’s even a little bit chilly here in the shade (I’m sitting on a bench underneath a tree). I crossed one of the bridges over to the opposite side of the Neckar and am in a park with what seems like half of the city’s population. This is clearly the place to be on a nice summer Sunday afternoon! Keeping up with this has been really difficult since the workshop began on Sunday evening—and I’m not sure how thrilling anyone would find my descriptions of eight hours a day spent in discussion sessions, anyway. We begin each day at 9:30, have several presentations and discussion throughout the morning and afternoon, and then spend each evening doing something different but still connected with the conference. On Monday and Wednesday, we had keynote speeches; Tuesday evening we went on a short walking tour of Heidelberg and a much longer tour of a brewery. 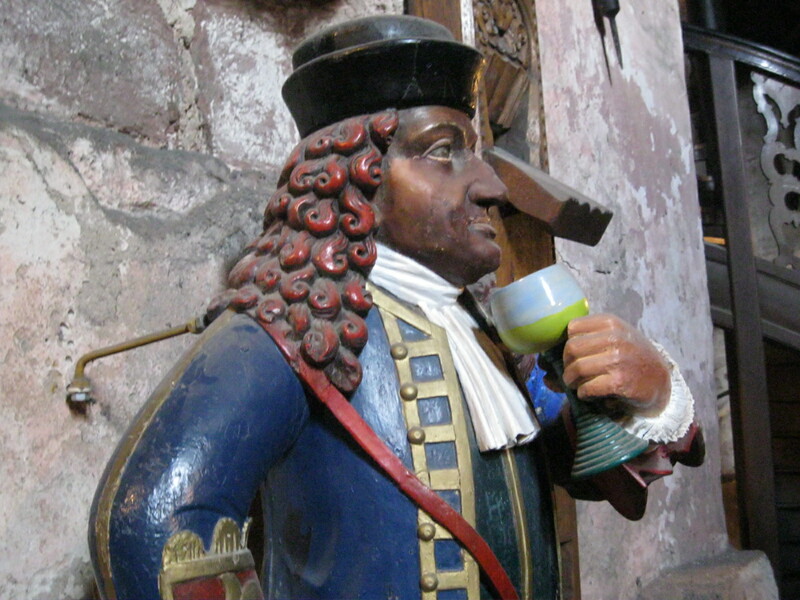 I did get an answer to my question about the Großes Faß and the quality of the wine it contained: Heidelberg farmers paid their taxes in wine during the eighteenth century, 10% to the king and 10% to the church. But of course, they wanted to sell their best wine, not give it up, so they would pay their taxes with the worst they had on hand (like a barrel left over from the year before that had gone bad), or would water down some of their current stock. All of this would be mixed together in the Big Barrel and consumed by the castle’s inhabitants. So there wasn’t any question of the wine going bad before they reached the bottom of the Big Barrel; it was disgusting from the start. The tour guide explained that the town continuously fights a battle to keep the castle from sliding down the hill where it’s perched. 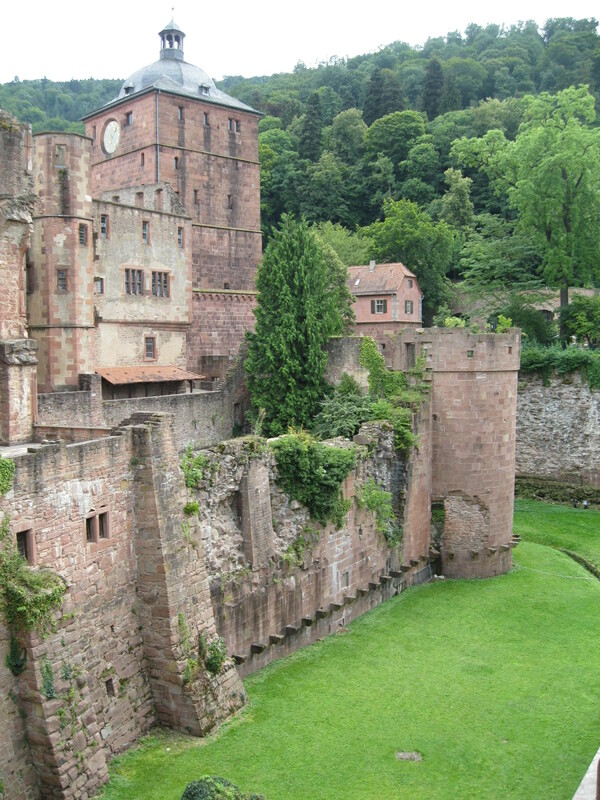 Heidelberg experiences earthquakes—small ones—from time to time, and in the 1960s, the government decided to build a train tunnel through the mountain atop which the castle sits. Add in planes and helicopters that buzz overhead, and the castle actually gets shaken quite a lot, which is causing it to shift ever so slightly downhill. Lots of engineers are working hard to keep that from happening, as you might imagine. The tour guide also told us that much of the charming housing I see in the Old Town actually stands empty, as people have become increasingly fed up with the noise of tourists and university students, the difficulty parking and getting around, and the older condition of many apartments. Maybe I could find a cheap place to live here! 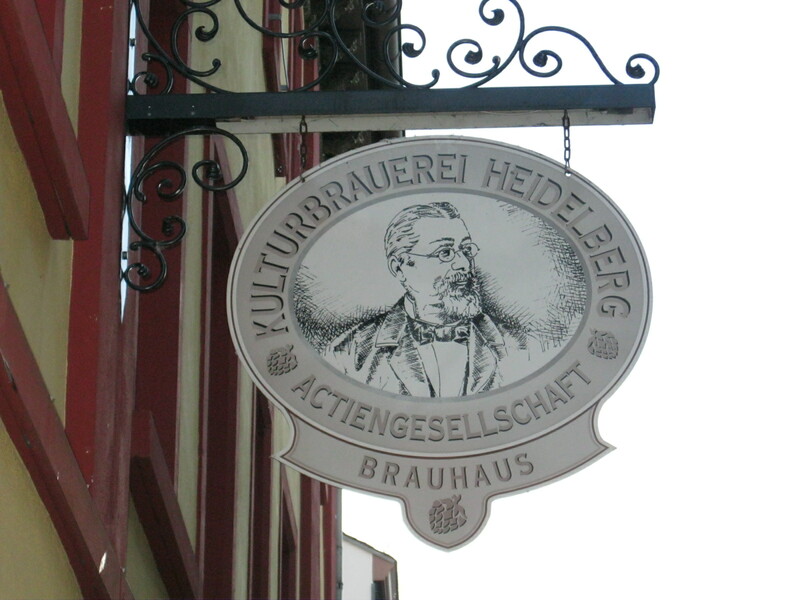 The Kulturbrauerei, the beer brewery we visited, is a tourist trap—but they do make good beer (I recommend the Hefeweizen). 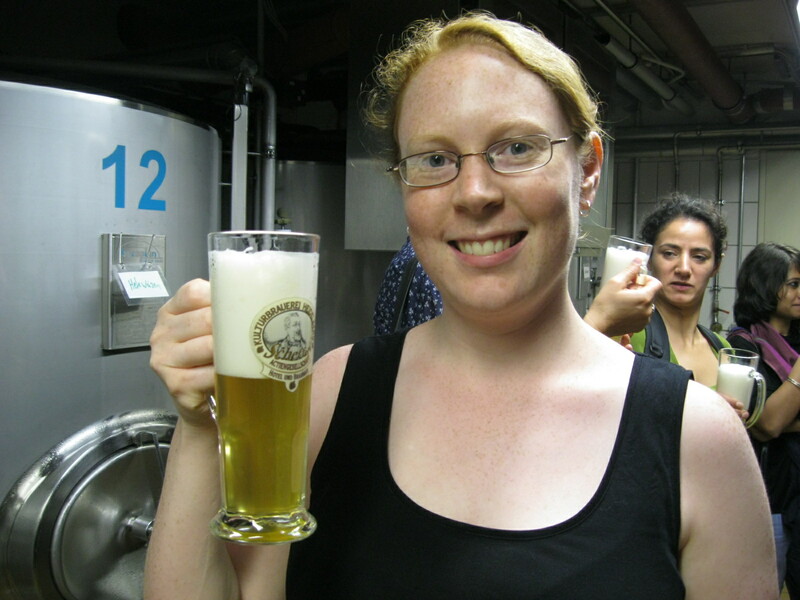 The owner of the brewery gave us a lesson in how Germans make beer, and I learned that the government has very strict regulations about what can go into the beer: only water, malt, hops, and yeast. Nothing else. No artificial colors or flavors, no enzymes or preservatives. It’s all-natural! The tour, of course, ended with sampling three of the brewery’s offerings (and soft pretzels), then almost all of us stayed and had dinner in their biergarten. I made the mistake of ordering creamed herring and finding out with the first bite that creamed herring is one of the most disgusting foods I’ve ever tried. Oily, fatty, rubbery, and fishy. And served cold, just to make things better! I ate a side salad and lots of potatoes. And had another beer. For the past couple of mornings, I’ve actually been eating breakfast at McDonald’s to save time. They offer a fast food version of the traditional continental breakfast: two rolls (one of which comes with a Golden Arches stamped on it), butter and jelly, and coffee. Doesn’t seem terribly unhealthy, though I’m sure McDonald’s ruins it somehow. 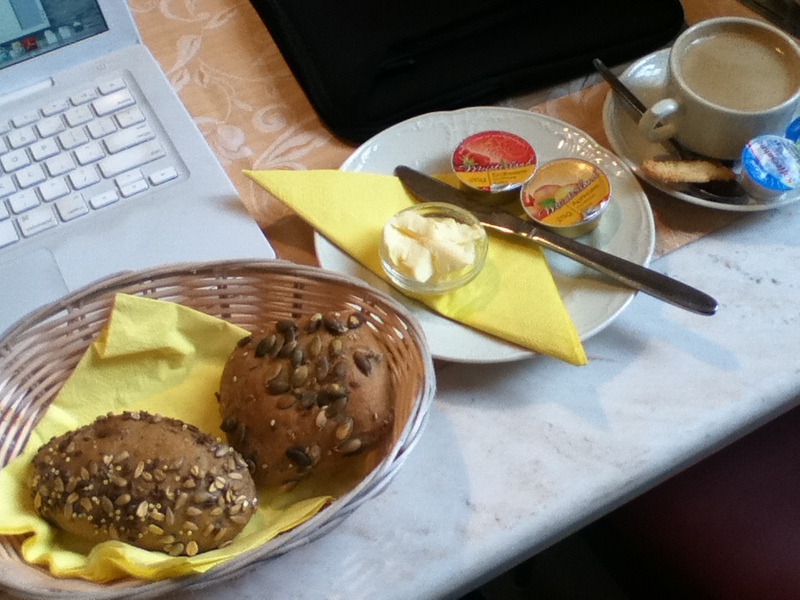 But this morning, I woke up early and took the bus over to Universitatsplatz to have breakfast at the Gundel Bakery, which is probably Heidelberg’s most famous and/or most popular bakery. The weather is so beautiful, though, that I got my egg sandwich and coffee to go and walked down to the river to sit on a bench and eat there. Then I went back to the bakery for a cheese danish and more coffee. I have to keep my strength up during these long days of intellectual activity, right? My last full day in Germany! Last night everyone in the group had dinner at the house of one of the Heidelberg professors, who lives right across the river in a row house with a beautiful garden out back. She and her husband spend a lot of time working on it, it seems, and there’s a large patio and gazebo surrounded by wildflowers. 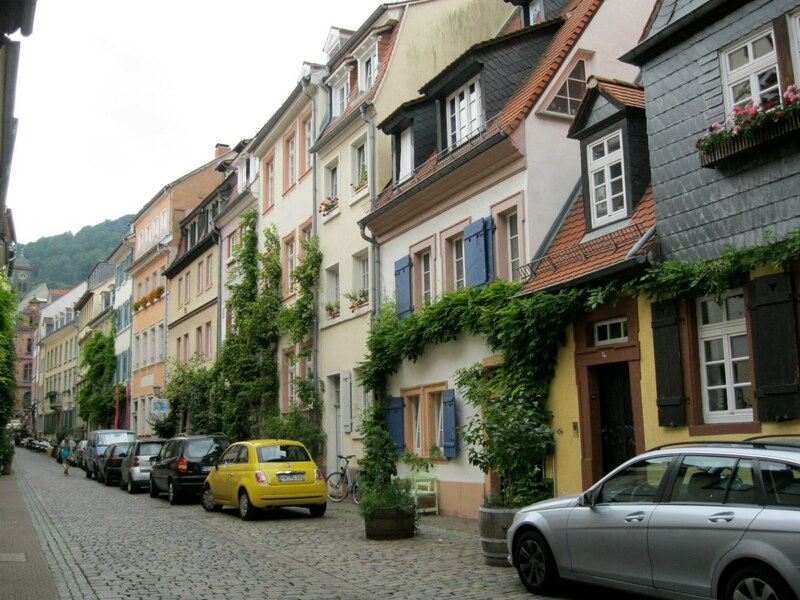 From what some of the other professors said, it’s unusual to have so much land with a house in Heidelberg (and their garden is just about the same size as the side yard and patio at my parents’ house), and extremely expensive to buy a place with that feature. I have seen quite a lot of balcony gardens, though, as people seem to fill those to the brim with flowers and plants.